I had a beautiful, three pound butternut squash sitting on my counter for about a month. It was the last item we purchased at the local farm before it closed for the winter, and for weeks I never seemed to be able to work it into a meal. I think that my subconscious mind was just in denial that the farm was closed until the spring, and that somehow, by preventing me from using the squash and having it sit on the counter instead, it was almost as if the farm never closed at all. But alas, my conscious mind won out, the farm is indeed closed, and the squash had to be used. New Year's day provided the perfect opportunity. I was already planning on roasting a pork shoulder (great recipe here), and I had some leftovers from a baked pasta/sausage and peppers combo I had made a few days prior, but was looking for a vegetarian option to round out the menu. 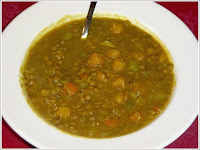 Perhaps a soup utilizing squash and lentils? A quick search on the internet yielded this recipe, which seemed to be just what I was looking for. After reading through the comments, I made a few modifications, namely increasing the curry powder and garlic, decreasing the amount of liquid by half, and adding in some chili powder and shredded coconut. Oh, and I left out the ginger, because I really don't like ginger. 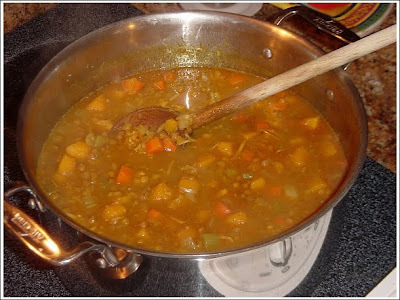 The finished product was a thick lentil stew, sweetened by the squash, with the the coconut providing a really nice reinforcing accent to the curry flavor. It was definitely a hit, and I've already made it again, although sadly, I had to get the squash at the supermarket. This is a very easy recipe. All the work is in the prep. Once everything is chopped, you heat the oil/butter in a large pot until the butter stops foaming, then add the onions, squash, carrots, celery, garlic, and salt then cook for about 15 minutes. Stir in the curry powder and chili powder and stir for a few minutes, then stir in the lentils and coconut. At this point, add the stock and simmer, covered, until the lentils are cooked. The recipe suggests serving over basmati rice, but I haven't done this yet as the stew is pretty hearty on its own. I also haven't tried the cilantro oil, because I don't like cilantro. The second time I made this recipe, I found it to be at its best on the third day. If you like your stew more like soup, just add more stock (the original recipe calls for twice what I used).